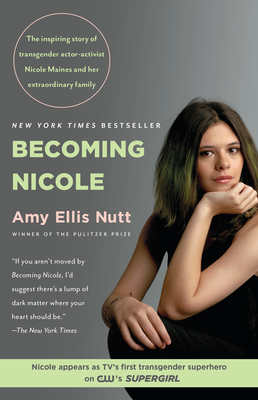 NEW YORK TIMES BESTSELLER • The inspiring true story of transgender actor and activist Nicole Maines, whose identical twin brother, Jonas, and ordinary American family join her on an extraordinary journey to understand, nurture, and celebrate the uniqueness in us all. When Wayne and Kelly Maines adopted identical twin boys, they thought their lives were complete. But by the time Jonas and Wyatt were toddlers, confusion over Wyatt’s insistence that he was female began to tear the family apart. In the years that followed, the Maineses came to question their long-held views on gender and identity, to accept Wyatt’s transition to Nicole, and to undergo a wrenching transformation of their own, the effects of which would reverberate through their entire community. Pulitzer Prize–winning journalist Amy Ellis Nutt spent almost four years reporting this story and tells it with unflinching honesty, intimacy, and empathy. In her hands, Becoming Nicole is more than an account of a courageous girl and her extraordinary family. It’s a powerful portrait of a slowly but surely changing nation, and one that will inspire all of us to see the world with a little more humanity and understanding. Amy Ellis Nutt won the Pulitzer Prize in 2011 for her feature series “The Wreck of the Lady Mary,” about the 2009 sinking of a fishing boat off the New Jersey coast. She is a health and science writer at The Washington Post, the author of Shadows Bright as Glass, and the co-author of the New York Times bestseller The Teenage Brain. She was a Nieman Fellow in Journalism at Harvard University, a Ferris Professor of Journalism at Princeton, and an instructor of journalism at the Columbia University Graduate School of Journalism. She lives in Washington, D.C.